We've carefully selected the shipping options for each product on our site to ensure you receive the fastest, safest, most affordable and most reliable delivery service available. Each item's delivery options will be noted on its product page and/or within the shopping cart. You can choose the shipping option that best fits your needs from those presented. We may at our sole discretion choose an alternate shipping method that is comparable or faster via a different carrier than the specific shipping option you selected. But rest assured that your order will be shipped via a shipping carrier and method that aligns and is similar or exactly your requested shipping method. Any Exceptions I Need to be Aware of? Delivery of items purchased from the mobileiGo.com or its affiliated Sites to addresses outside the United States is limited. Some items also have restricted delivery within the United States. For delivery restrictions, see Where can orders be shipped? Signatures are not required for most Small Parcel deliveries, but the decision to leave your package will ultimately be at the discretion of the delivery carrier. If you have any special delivery instructions for the carrier, we suggest you place a note on your door on the delivery date with your name, request, and tracking number. Please note: Orders placed outside the time frame listed beside your shipping option or elsewhere on the site will be shipped the next day. Additionally, deliveries are rarely if ever made on Saturdays or Sundays. Please allow the full processing time required to ship from our fulfillment centers or the supplier’s warehouse, plus 3-14 business days in transit for delivery. Please allow the full processing time required to ship from our fulfillment center(s) or the supplier’s warehouse, plus 1-10 business days in transit for delivery. Please allow the full processing time required to ship from our fulfillment center(s) or the supplier’s warehouse, plus 2-3 business days in transit for delivery. Please allow the full processing time required to ship from our fulfillment center(s) or the supplier’s warehouse, plus 1 business day in transit for delivery. Additionally, deliveries are rarely if ever made on Saturdays or Sundays. Buyer/customer is always responsible for all and any customs, duties, import costs or fees or any other border related costs. Most items can be shipped abroad to most countries. Again, the buyer/customer is always responsible for all and any customs, duties, import costs or fees or any other border related costs. Some items and associated items including but not limited to some weapons, associated parts and accessories are restricted from export from the United States. You, the buyer are fully responsible for complying with all United States regulations and restrictions regarding exportation of any goods. Please read our International Export Agreement and Statement fully and carefully for all international orders. When you use this website, mobileiGo.com or any affiliated website or marketplace, or purchase any item from this website, mobileigo.com or any affiliated website or marketplace, you, the buyer/customer, agree fully and completely to the International Export Agreement and Statement and all policies detailed and stated in writing on all pages of this website. In order to offer you, our customers, the widest most varied selection on the internet, mobileiGo.com and its affiliated Sites and affiliate marketplace entities ship from warehouses all across the United States and sometimes within other countries as well. Each warehouse’s lead time varies based on many different factors. Some warehouses stock items that can be shipped the same day or within 24 hours. Other items require more time to be shipped (for example, 2-4 weeks). Product pages and/or the shopping cart on our Sites and marketplace stores may include the estimated Lead Time, "Usually ships in ________ ," to give you an idea how quickly your order should leave the warehouse. These are estimated times and are not guarantees. Actual lead times may vary from those stated estimates. For Small Parcel shipments within the United States, delivery usually takes between 1 and 7 business days (except for USPS Standard or First Class which ships in 1-10 business days) after your order package is picked up from the warehouse. For expedited services such as Expedited, 3-day, 2-Day or Next Day Air, your order's travel time is locked in to the given speed you select after the item leaves the warehouse. These times do NOT include lead time or any order package/shipping preparation time. For products that display 'Arrives by Christmas', mobileiGo.com and its affiliated Sites are not and will not be responsible for late shipments resulting from carrier delays or any other causes beyond our control. Click on the "Track Packages" link in the Orders section on the Welcome page of My Account or access the track my order link(s) from within your shipment confirmation email(s). Or log into your marketplace online account (Amazon, eBay, etc.) to find your tracking number(s). If you have more than one order that has shipped, select the specific order on the My Orders page that contains the item(s) you wish to track. If the items you'd like to track have been shipped, the tracking information will be displayed for you there. All provided tracking numbers and tracking progress details are statements and estimates from the carrier/shipper. These are purely for informational purposes and are never promises or guarantees of any kind. Estimates or Estimated delivery times are only estimates and never constitute a guarantee of any kind. mobileiGo.com and its Sites and affiliates are not related to or bound by the third-party carrier/shipper in any way. Any time or delivery estimate claims or estimates listed, published or communicated by any carrier/shipper (e.g. USPS, FedEx, UPS, DHL, etc.) is the sole responsibility of the carrier/shipper. mobileiGo.com and all of its Sites and affiliated entities are not and cannot be responsible for any statement, listed, published or communicated by any third-party carrier/shipper. Also, mobileiGo.com and all of its Sites and affiliated entities do not promise or guarantee or condone or agree with any statement, listed, published or communicated by any third-party carrier/shipper. mobileiGo.com and all of its Sites and affiliated entities will not and cannot be held responsible and will not and cannot provide any kind of compensation for tracking errors, carrier/shipper errors or delays or any issues or complaints arising from estimates or claims by the carrier/shipper. YES! Under certain conditions or at certain times as specified on the site. Look for the "Free Shipping" banner or message on any page of our site for the free shipping conditions and your eligibility. Items displayed with FREE SHIPPING! on the product page will ship for free; some restrictions and conditions apply. 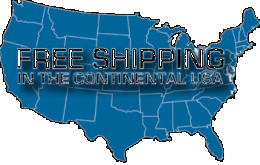 At times we may also offer free shipping based on other stipulations such as your combined order total as calculated in the site's shopping cart or certain product combinations. Or we may simply offer free shipping under any conditions that we decide at our sole discretion. Of course this ultimately benefits you, our customers. In order to keep your costs low and our pricing simple, yet competitive, we either provide free shipping or, in certain cases, charge shipping per item or per package weight. This charge, if any, is indicated in your shopping cart and covers ground shipping within the contiguous United States. We won't surprise you with any hidden charges or handling fees. The price you see in the shopping cart is the price you pay, with one exception: if you are shipping an order to an address within some states such as Georgia, we are required to charge sales tax. Caution! Watch out for competitor sites that hide certain shipping charges and surprise you with extraneous over-priced shipping and handling fees or oversize charges at the very end of the checkout process. Ensure you’re aware of the final, total cost of your purchase when shopping around. Exclusions: Certain products we offer do carry associated shipping charges either per item or per Order Amount. The total item shipping charges, if any, will be detailed in the shopping cart prior to checkout. Order Amount for promotional shipping does not include or apply to gift cards, bulk orders, applicable shipping charges, international fees, or sales tax. Some products have specific shipping charges and are not eligible towards the qualifying amount for the reduced promotional shipping rates or free shipping. Other eligible product(s) in your shopping cart at the time of checkout will still count towards the qualifying Order Amount total. Simply put – our pricing is straightforward and all-inclusive to save you time and energy. For your convenience, most orders are eligible for the option of sending individual products to more than one address within the one order. This option may not be eligible for some orders.